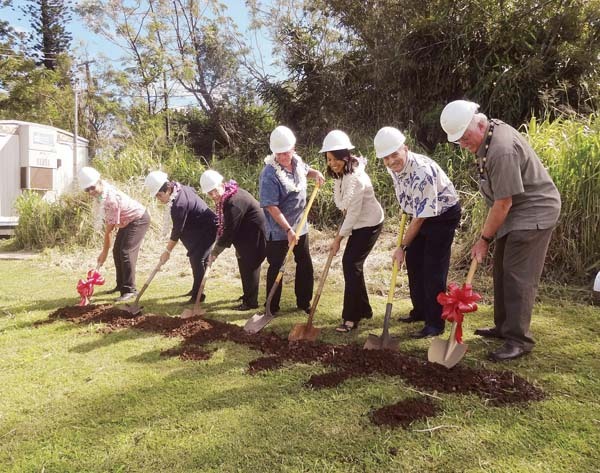 Maui Youth & Family Services broke ground on its new Coordinated Programs Facility in Makawao at the beginning of the month. The $2.7 million project will be a central hub for training, meetings, supply distribution and program management for MYFS and partner agencies, Aloha House and Malama Family Recovery Center. The three agencies provide behavioral health services to more than 5,000 people in Maui County annually, an MYFS news release said. The groundbreaking was held on March 1 with kupuna Kimokeo Kapahulehua and Hawaiian cultural practitioner Vene Chun blessing the site. Attending the event were Maui County Council Members Alice Lee and Mike Molina, MYFS and partner agency staff and board members and representatives of funder Central Pacific Bank and Banks Pacific Construction, which is building the new facility. The project is expected to take a year to complete. The facility is funded in part by grants from Maui County, the state, Central Pacific Bank Foundation and the Atherton Family Foundation, which are being expended to begin grading and infrastructure construction on the new site. Efforts are underway to raise the additional $1.3 million needed to complete funding for the project, MYFS said.